The author is Director of The British Council, Wales. Strong ties between Wales and Yemen derive from the times when Welsh coal was stockpiled in Aden to provide fuel to British ships going out to the Far East. From that time the Yemeni community in Wales stands as one of the oldest ethnic communities in the UK. Friends of this community and of the Yemen celebrated these links with the Yemeni festival in Wales in i997, and then in 2001 approached British Council Wales with a request for support for further artistic exchanges between the two countries. It was decided to set up a three-year residency exchange using the conduit of the British Council offices in the two countries to identify and administer the programme. The programme was to be not only artistic but also academic; host institutions in the two countries would be centres where teaching could benefit from the enrichment of a new source of artistic thinking and production. The University of Wales Institute Cardiff, Department of Art and Design, and the Swansea Institute of Higher Education, School of Art and Design, both expressed interest in acting as hosts in the exchange programme. So, after an exploratory visit from Sana’a in 2002, Najween Al-Atef from the Aden Institute of Art was identified as the first artist to start the residency programme. Welcome support was provided for the visit by the British- Yemeni Society as well as generous accommodation and materials by the two Institutions concerned. 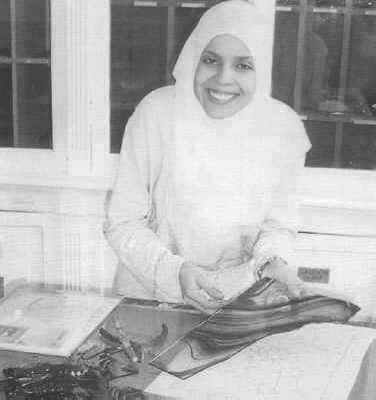 Najween Al-Atef arrived In the UK on 30 March 2003 and spent her first three weeks at the University of Wales Institute Cardiff. She worked there in the silk screen paint section as well as in ceramics. In both departments she was able to work with specialists in those fields and produce pieces of work which she was able to take back with her to the Yemen as well as leaving prints and copies in the UK. At Swansea Institute of Higher Education she extended her own expertise in design to transfer some of her ideas on to glass - one of the major strengths of the Institute. She also worked on photography, one of her major interests, coming as she does from a background of industrial design (one of her major projects in Yemen is to produce more attractively designed support equipment for the disabled such as wheel chairs and appliances). Through the good offices of Anis Shamsan, a Yemeni who has lived in Britain for some years and has himself worked with disabled minority groups in both Cardiff and Birmingham, Najween was also able to visit galleries in Birmingham, Liverpool and London. In London she was guest of the British- Yemeni Society at a lunch on Friday 9 April attended by the Yemeni Ambassador to Britain. The success of this first leg of the residency exchange can be largely attributed to the wide range of skills that Najween brought to her work in Cardiff and Swansea, but also to her charm and adaptability on what, it was hard to believe, was her first visit outside the Arab world. As an ambassador for Yemen she proved delightful, as an artist she was skilled and perceptive and alert to the potential application of arts from the two countries to her own sector of interest. The next leg of the residency programme will take place in Yemen in late 2003/early 2004 with an artist chosen from the two Welsh Institutes. Bill Heber Percy, Pat and Charles Aithie, Jennifer Spencer-Davies, Douglas Gordon and Julian Paxton are all to be thanked for contributing to the success of the visit, and most especially, of course, Chris O’Neil and John Howes at the two Institutes. A special mention too for Kim at Cardiff and Andrea Liggins at Swansea as well as Khadija and Adrian at the British Council in Sana’a. We all look forward to the next stage - an outward visit from Wales to Yemen later this year or early next.